My Favorite Things, Part III: Gauntlets! 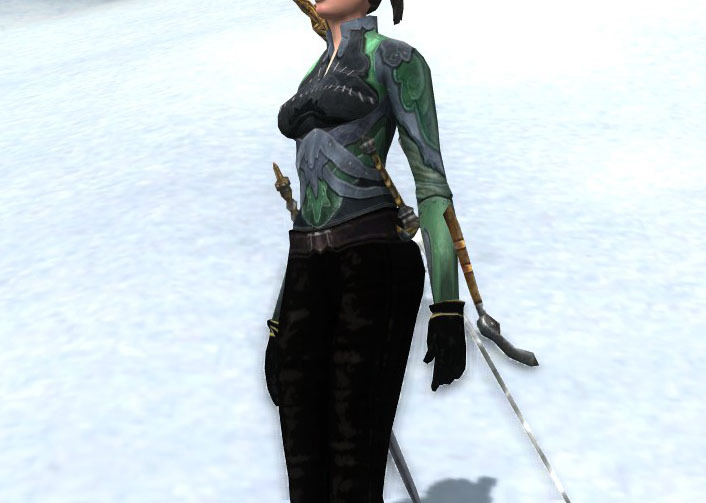 So, one cosmetics-nerd fact about me is that I’m addicted to gauntlets and gloves. Those are often the pieces I spend a good long time fretting about: I want them to be right. And, of all the items in-game, gauntlets and boots seem to suffer from the most clipping issues — that is, when I put a great pair of gauntlets on a character, and the pixels from their hauberk or robe still show through. Vexing! Anyway, fashion’s in the details, I suppose. So here are a few of the gauntlets that I default to, time and time again. How about you? 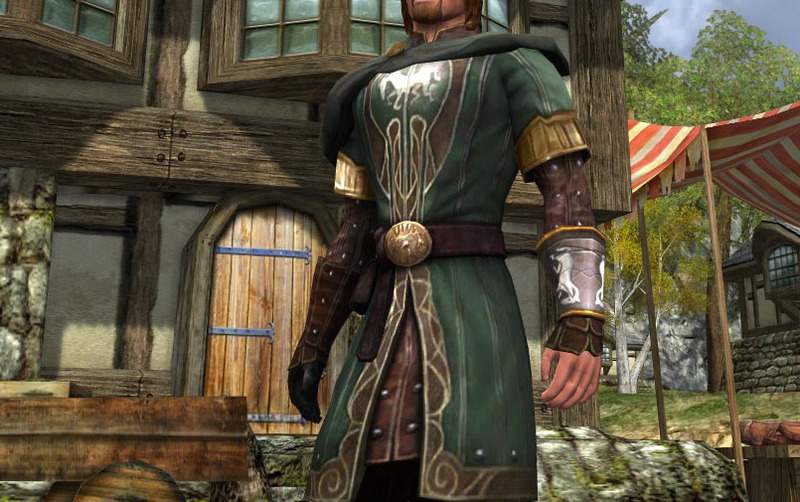 The Gloves of the Eorlingas and its identical items in the other Rise of Isengard pre-order armour sets are fantastic items for Rohirrim characters, and given that I am ALL ABOUT ROHAN, I use them a lot. I love how the one gauntlet is fingerless and has its white-horse motif. They’re fantastic gauntlets that can be used with a lot more than just the outfit of which they’re a part. The Fingerless Gloves are a Yule reward for if you help out the poor. They’re awesome. They dye very dark, so keep that in mind, but they’re great for simple laborer or craftsman characters, and I use them all the time. 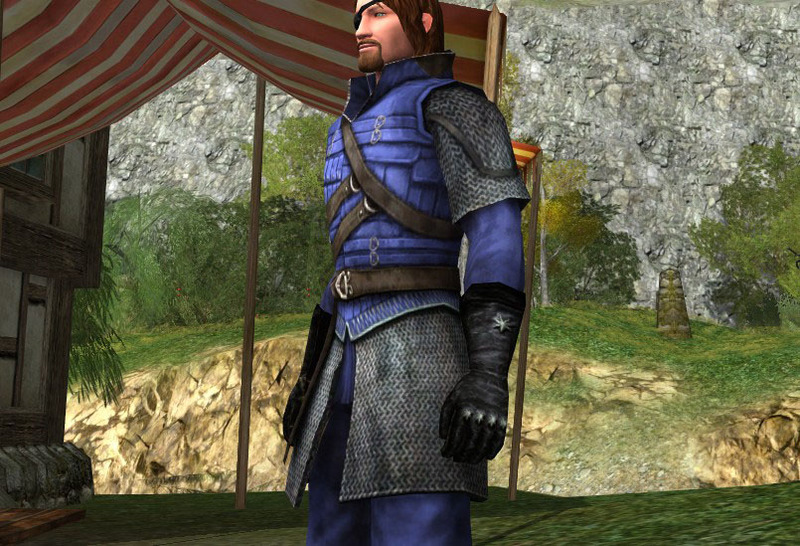 The Fine Grey Company Gauntlets please me for their …Numenoreanness (that’s a new word for sure), just as much as the Eorlingas ones please me for their …Rohanness. I adore the small star motif, and how battle-roughened this piece looks. Dreng-folme, man. I love the Dreng-folme gauntlets. 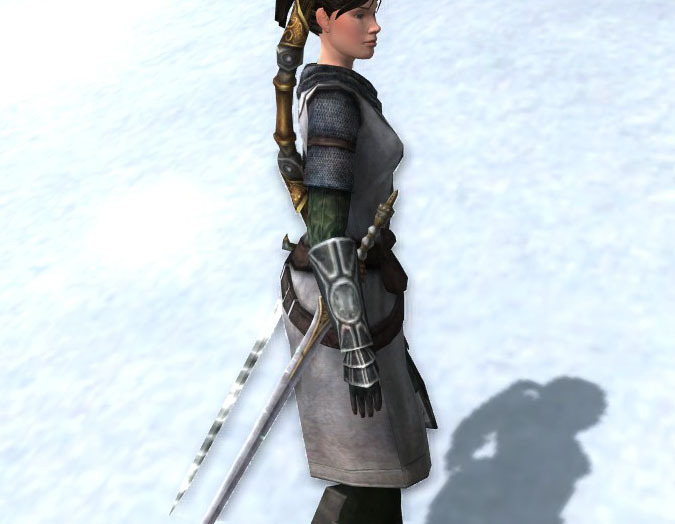 I’ve shown the outfit below before (in my mind, it’s called “The Hauberk with the Oliphaunt on It”), and I still love it. The gauntlets have a unique banded effect, and again look like they’ve been used and weathered over time. So how do you Yule-fest-goers feel about those rich? If you’re a fan, you’ll end up with the Extravagant Festival Gloves. They dye in a deep, saturated way, they have a red gem-like detail and a small gold band at the wrist; they’re just great. I tend to use them for higher-style outfits that still allow gloves. Finally for now, I really like the crafted Vibrant Calenard Battle Gauntlets. The circle and sunburst sort of motif really pleases me, and the gauntlets have the heft of plate. ← My Favorite Things, Part II: Robes! Ooh. That inspires me to add Gondoricity to the new lexicon. Terms APPROVED. The extravagant festival gloves are my favorite go-to gloves. I also really like the long gloves…Fur-Lined Storyteller’s Gloves. They’re a quest reward from the Dunland questlines and fairly unusual. I don’t know of too many elegant, to-the-elbow gloves in-game. I adore the Yule Fingerless Gloves and use them with so many outlets. They certainly add a punch of attitude. 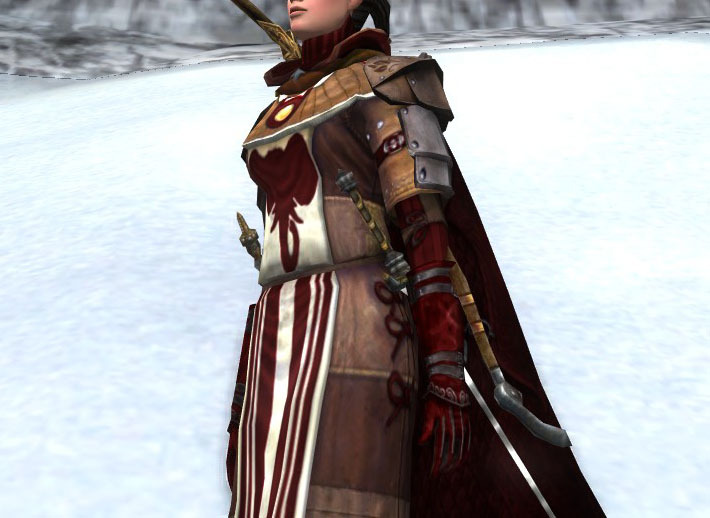 The Gloves of the Eorlingas are nice, but the fact they do not match bugs me for some reason. I wish that there were two sets, both fingerless and with fingers, because they are really nice. 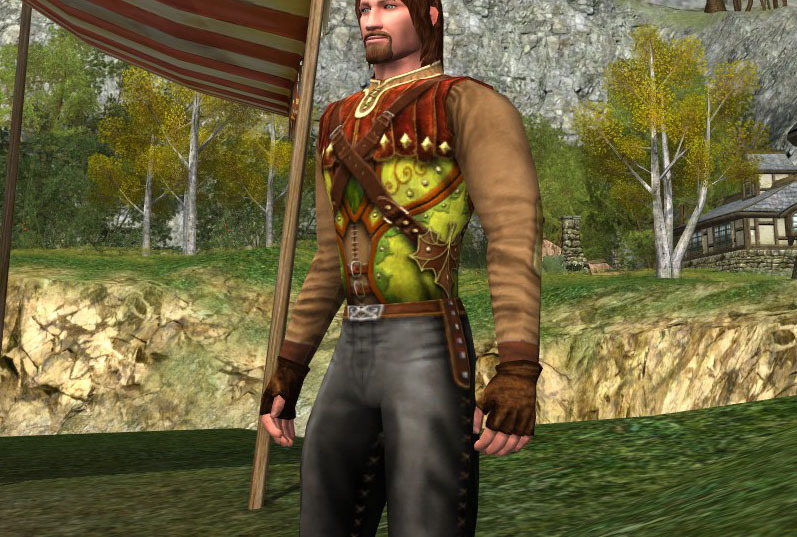 Another pair of fingerless gauntlets that no one has mentioned so far would be the Spearman’s Singed Leather Gauntlets from Dunland.